The prospects for mobile-phone growth in Nigeria are among the most lucrative for telecom operators globally, but also the most challenging. Only some 45% of the approximately 192 million people in Africa’s most populous nation have an active cellphone, according to Groupe Speciale Mobile Association, making the country one of the biggest potential growth markets in the world for mobile operators. In Europe, 84% of people have an active cellphone, while in Japan, subscriber penetration is 95%. 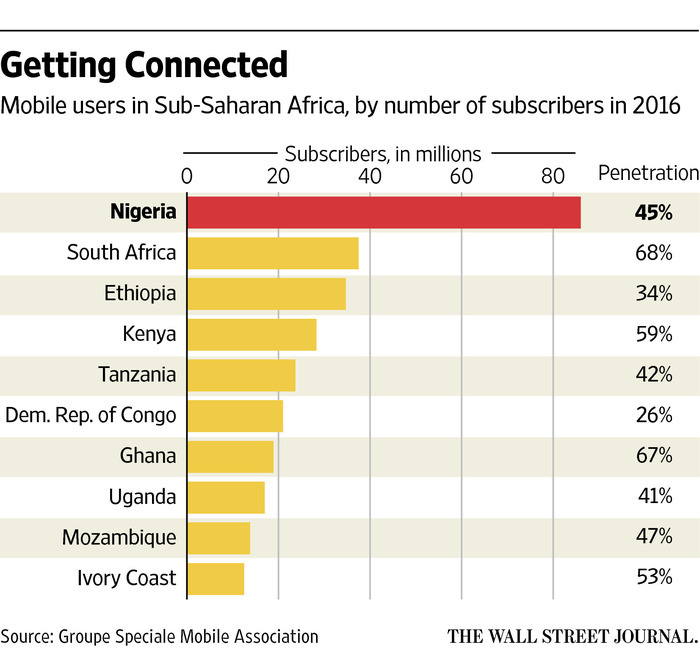 Nigeria is expected to add some 27 million mobile-phone users—the fourth-biggest increase of any country in the world and more than any other African nation—by 2020. In 2016, Nigeria’s telecom sector contributed 6.05 trillion naira ($16.84 billion), or 8.9% of the country’s GDP. 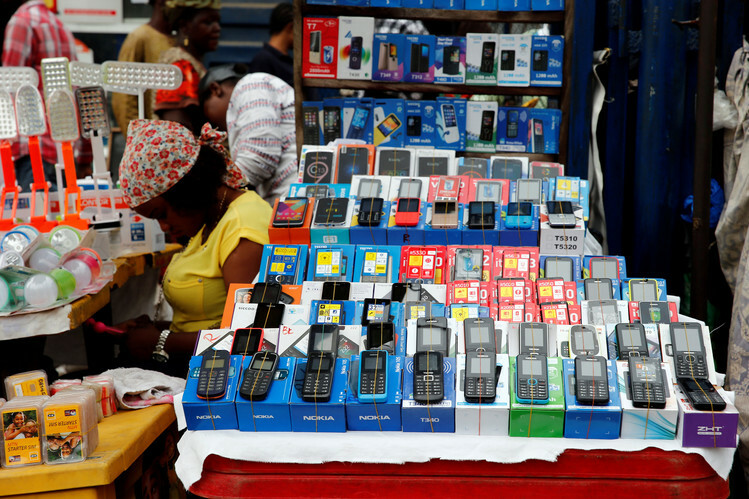 Smartphones, which drive revenue through data consumption, are still too expensive for many of Nigeria’s consumers. And because network coverage is so poor, Nigerians who do own a phone often carry two or more SIM cards to better utilize the pockets of coverage in their cities and take advantage of different networks’ promotional deals. This allows mobile operators to nab the same customers on multiple networks, potentially doubling or tripling Nigeria’s market size. The GSMA says there are actually 152 million active SIM cards in Nigeria, nearly double the number of individual subscribers. But companies seeking to profit from the rough-and-tumble Nigerian telecom sector have to navigate shifting regulations, billion-dollar fines from a cash-strapped government, wild swings in the local naira currency and foreign exchange shortages as well as the absence of a reliable national power grid. The challenges have adversely affected the market as regulatory burdens hamper operators from growing more quickly. Segun Ogunsanya, chief executive of Airtel Nigeria, a subsidiary of Indian telecom giantBharti Airtel Ltd. , which has 34 million subscribers in Nigeria, says the growth opportunities are massive, though suppressed by the country’s heavy-handed regulation and fines. Airtel’s Africa unit turned a pretax profit for the first time during the year ended March 31. Nigeria is one of 15 markets Airtel operates in on the continent, though the company said a massive 54% depreciation in Nigeria’s naira currency against the U.S. dollar hit its overall earnings last year. A vendor waits for customers as she uses her phone in Ikeja. Last month, the Nigerian Communications Commission, the country’s telecom regulator, blocked one of the sector’s biggest players, Nigeria’s privately owned Globacom Ltd.—which has 37 million subscribers and a partnership with British telecom giant Vodafone Group PLC—from proceeding with a planned free-data-day promotion. Glo Nigeria had planned to offer subscribers 200 megabytes of free data on Aug. 11 to encourage data usage, but the NCC said the promotion went beyond what was allowed under its regulations. The most-concerning move for investors was the $5.2 billion fine the NCC slapped on South African operator MTN Group Ltd. after it missed a deadline to deactivate more than 5 million unregistered SIM cards under regulations intended to combat terrorism. In June 2016, the fine was reduced by 330 billion naira ($1.7 billion at the time, now $917.9 million due to a drastic weakening of the naira), payable over three years, following lengthy negotiations. Nigeria is MTN’s largest market, and its operations there accounted for 28% of the company’s revenue, which was 64.39 billion South African rand ($4.99 billion) in the six months ended June 30. MTN plans to list its local unit on the Nigerian Stock Exchange in 2018. It’s not only regulations that companies have to contend with. Limited foreign currency availability and access to capital are also challenges. One of Nigeria’s largest players with 18 million subscribers, United Arab Emirates-owned Emirates Telecommunications Corp., which trades as Etisalat, pulled out of its Nigerian operations in July after talks with local lenders to renegotiate a $1.2 billion loan failed. In 2016, Etisalat’s Nigerian operations generated earnings of 33 billion naira before interest, taxes, depreciation and amortization. Etisalat Nigeria now operates under the name 9mobile after a forced rebranding. The experiences of mobile operators in Nigeria are symptomatic—though extreme—of encounters with regulators across the continent. South African operators MTN and Vodacom Ltd., which are active throughout the continent, say their respective earnings were hit after other governments, including Uganda, Cameroon, Democratic Republic of Congo and Mozambique, ordered the disconnection of unregistered SIM cards from their networks, following an earlier move by Nigeria’s regulator. Another issue that’s keeping telecom growth down in Nigeria: Many consumers can’t afford to buy a smartphone. “Handsets, it’s 50% of the problem,” said Ibrahim Dikko, vice president of regulatory and corporate affairs at 9mobile. Mr. Dikko said the company was working with smartphone makers including Transsion Holdings Ltd.’s Tecno, a Chinese mobile-phone manufacturer whose handsets allow consumers to insert and flip between two SIM cards simultaneously, to offer sub-$100 smartphones to customers. Mr. Dikko added that the other 50% is improving broadband coverage, particularly in rural areas. Despite the challenges, the opportunity is rich: The telecom industry has been a rare bright spot for the country’s oil-dependent economy, which fell into recession last year as prices wallowed below $50 a barrel. With the economy forecast to return to positive growth this year, mobile operators are chipping away at the market’s structural flaws. Total capital expenditure in Nigeria’s telecom sector is estimated to rise 14% to $1.6 billion, according to the GSMA. This entry was posted on Saturday, September 16th, 2017 at 6:52 pm and is filed under Nigeria. You can follow any responses to this entry through the RSS 2.0 feed. You can leave a response, or trackback from your own site.